Today’s educators have large classes and little resources, which makes providing an education tailored to each student almost a grueling task. Getting the the right resources, data, and time in classes with 30+ kids would require an amount of administrative time that educators don’t have at their disposal. Some teachers are starting to make an attempt to do it with the help of independent tools like Kiddom and Khan Academy, and some teachers are pushing state legislatures to use standard based grading, but overall, the industry is very behind on this field. Schoology saw an opportunity to help teachers spend more time on what really matters, their students, and less time in administrative tasks to set up and follow up those individualized paths. We knew that our competitors already had some rudimentary solutions of Personalized Learning so to be competitive we needed to come up with a solution that met the needs of our educators. Different teachers were at different stages of the journey. Teachers wanted different results based on areas of the journey and teaching styles. No LMS (learning management system) is tackling Personalized Learning from a holistic view or at all. The only viable solutions are offered by smaller starts up/ companies but those were often isolated solutions that could not integrate with larger, enterprise LMS (learning management system). The idea of Personalized Learning means something different to our users. Personalized Learning is a set many of activities that the teachers would want to perform on their students. School district adoption of standard based grading was uneven, making it harder for certain schools and teachers to successfully implement Personalized Learning methodologies in their classrooms. Build a foundation that can help teachers and school districts build upon at different touch points in the journey of Personalized Learning. Create a toolkit that allows different teachers to adopt whatever tools best resonate with their teaching methodologies. Personalized Learning field is very green and is uncharted territory in the industry. PL Methodologies are gaining a lot of traction with teachers and school districts, and the schools see it as the solution to the broken education system. 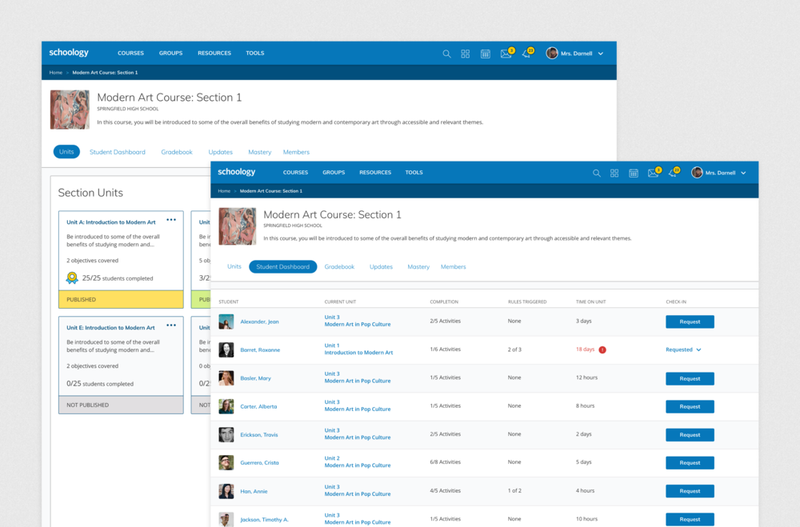 Schoology needed to define what Personalized Learning in the LMS would be, and so the first step to creating the Personalized Learning was to create a vision of what this tool or ecosystem would look like. Based on our many conversations with clients and school districts from conferences and events, we had data that formulated some ideas of what this tool could look like and how teachers would use it in their classrooms. We started off with some high level wireframes of two concepts and did a round of interviews with 10 teachers and curriculum specialists that were the champions of Personalized Learning in a few districts across America. After the first round of interviews, it was pretty clear that our users all had different ideas of what Personalized Learning meant to them and how they would use these methodologies within their classrooms. Our users were split between the two initial concepts we showed them, and it was clear that our users needed a variation of both concepts. We created the next round of designs in a high fidelity mockup and did 8 rounds of usability testing through video chat. 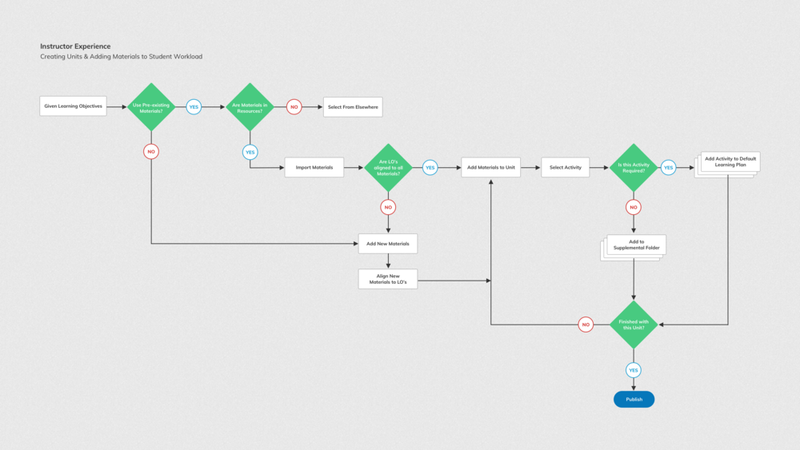 We then sent out an unmoderated test on Optimal Workshop and asked our users to complete a handful of tasks. Overall we had 372 responses and the test results were positive. Our users were excited to get their hands on the new Personalized Learning feature. When we created the designs for this vision project, we designed it with no technical limitations or technical scope in mind. We wanted to understand all of the tactics that the teachers would use and how they would handle them within the feature. After working with the engineers to plan out the development, we cut down the scope of the vision so we could release the first vertical slice with the time and resources we had available. The MVP would have to accommodate a set of features that we knew our teachers really needed. We focused on creating pathways and funneling students into pathways based on their mastery scores for the first slice. With the first design slice we did 9 interviews and usability tests, and 2 surveys to validate and make sure that even though we were cutting the scope of the initial vision our users would still be able to use the feature and that it would solve their current pain points. Currently this project is in development and is expected to be launched by the end of 2019.